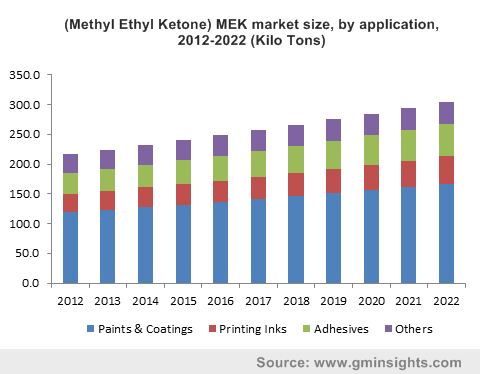 Methyl Ethyl Ketone (MEK) Market size was estimated at over 1.4 million tons in 2014 and is likely to exceed 1.9 million tons by 2022, with gains at over 4%. Increase in paints & coatings demand owing to growth in construction spending, particularly in Asia Pacific and Middle East & Africa, is likely to drive MEK market size over the forecast period. It is widely used as solvent in paints & coating applications owing to properties such as low viscosity, strong solvency and high evaporation rate. It is mainly used with polyurethane, epoxy, acrylic and polyester coatings due to miscibility with hydrocarbons without any effect on its characteristics. Asia Pacific construction spending market was dominated by China, India and Indonesia. China construction spending was worth around USD 1.78 trillion in 2014, whereas India and Indonesia construction spending was over USD 425 billion and USD 265 billion respectively in 2014. Asia Pacific construction market was the largest and accosted for close to 40% of the total volume in 2014. This factor is likely to drive MEK market size over the forecast period. Global increase in vehicle sales over the past few years and expected production rise over the forecast period is likely to drive methyl ethyl ketone market size for paints & coating applications. It is also used as solvent in automotive paints industry which is essential for durable coating. Global vehicle (commercial & passenger) production was close to 84 million units which is expected to surpass 100 million units by 2018. It is used in conjunction with alcohol for pharmaceutical industry to manufacture products such as anaesthetics, antiseptics, lotions and medical drugs. Increasing number of healthcare facilities coupled with advancing medical research is likely to drive demand for pharmaceutical applications. Breaking quaternary structure of proteins and increase drug penetration are major factors for its use in pharmaceutical applications. Favourable crude and downstream petrochemical supply is expected to result in an attractive MEK (Methyl Ethyl Ketone) market price trend over the forecast period. Stringent environmental norms over health concerns are likely to challenge industry growth. The EPA enacted the 33/50 Program which invites the voluntary reduction of the emissions of certain high priority toxic materials which includes MEK. Paints & coatings application dominated methyl ethyl ketone market size with revenue generation exceeding by USD 1.2 billion in 2014 This application is likely to witness significant gains up to 2022. Paints & coatings include powder coatings, waterborne coatings, solventborne technologies and specialty coatings. Increasing demand for powder coatings from automobiles and electronics industry is expected to drive methyl ethyl ketone demand. Printing inks application accounted for over 14% of the total volume in 2014 and is likely to witness significant growth rate up to 2022. MEK is extensively used and preferred solvent in printing industry owing to advantages offered such as excellent drying times, adhesion with substrates such as plastics, metals & glass and allowing formulation of specialized inks. Growth of end-use industries such as food processing, pharmaceuticals and cosmetics are anticipated to drive demand for printing ink applications. APAC MEK market size was dominant with China being the largest consumer base in 2014. China accounts for more than 35% of the total installed capacity. Growth of end-use industries such as construction, automobiles and electronics is likely to drive demand in the region. North America industry was majorly driven by the U.S. MEK market size and occupied a share of over 18% in 2014. North America is likely to witness moderates growth rates during the forecast period owing to recovery of industries post recession coupled with emphasis on using green solvents driven by strict environmental norms. MEA occupied a smaller chunk of the global share with countries such as Saudi Arabia, Qatar, Bahrain and UAE MEK market size expected to witness an increase from paints & coatings demand owing to growth of construction industry. The global MEK market share is concentrated with top four industry players catering to over 50% of the total demand. Major industry participants include ExxonMobil, Zibo Qixiang, Maruzen Petrochemicals and Sasol Solvents. Other prominent industries include Shell Chemicals, Arkema, Petro China, Idemistsu Kosan, Lanzhou Petrochemicals and SK Energy.